Hello! Let's start with a super unglam shot of me without my makeup. Yes this is probably the first time I've posted on my blog of me makeup-less. So before you run away or maybe even start hating... I just loved how my hair looks like! The curls and the volume, usually if I did it on my own, which you would see in my pictures, my hair can be pretty flat as it's really long and heavy. 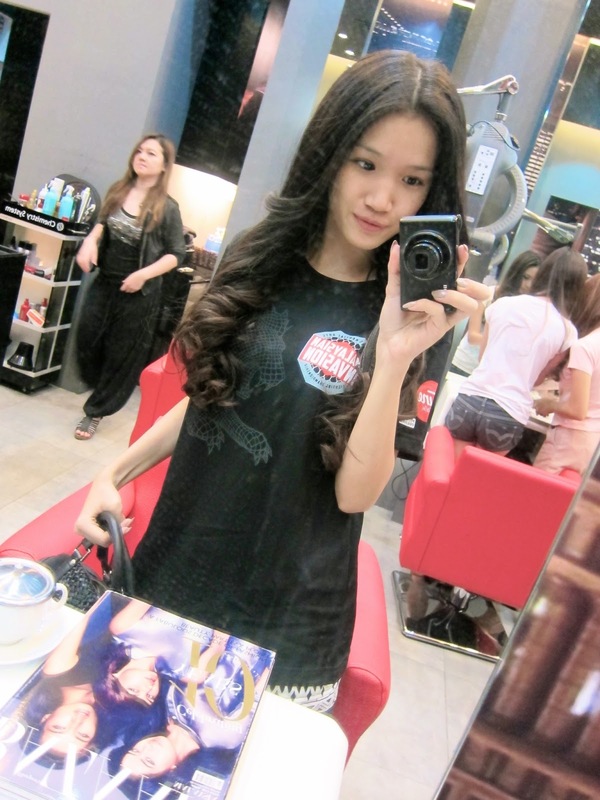 Love how this salon in Paradigm mall managed to make it so poofy. So anyways I was part of the 2013 MIMMA Ring Girl Search! Joining pageants/competition could be really fun, the process, the new friends, the experience, basically the whole package is just really rewarding but when it comes to the point where I have to go up on stage I always feel like killing myself as I have major stage frights. Behind the scenes of pageants are actually in fact not that glamourous as you thought it would be. Girls frantically running around, people yelling at you to get in line and what not, break downs, and the list goes on. Usually I would be the one observing all these haha. After makeup with the girls! There was actually 20 of us but the rest was still busy with their makeup and so on. I actually like this pageant as it was quite relaxed, we only had practice on two days, plus the management took really good care of our safety and timing. They really prioritized us. I guess that's the plus point of joining pageants with big sponsors. After our hair and makeup we headed out to watch the match. The panel of judges that would be judging us later. I love Christine! She's so lovely and she was smiling all the time. Before the match started, all the fighters were presented on stage. The fights commenced after. It was my first time watching mix martial arts in action. It was pretty intense and the energy from the crowd was spectacular. The girls and I were jumping and shouting cheering on the fighters. Here's a picture of me and Christine Hallauer, isn't she just gorgeous! Congrats to Mervyn and Lisha for being MIMMA's Ring Girls!